The Felucca is a type of dhow, a traditional boat characterized by two tall lateen sails. It represents a part of Egyptian culture and the closer to the culture once can get the better. The Felucca has been historically important to commerce in the Nile area. Feluccas were the main means of water transport up until the mid of the 19th century. Today the Felucca is giving at minimal costs the more adventurous people an authentic experience while sailing the Nile. You’ll take part in a history that spans millennia and doing so the native people of our country have done for generations. It is the ideal way of getting to know the river and its people. As well as observing life in the many small villages and farms along the way. Watching the farmers work their fields from the deck of a Felucca is truly a magnificent experience. The Felucca is not quite comfortable as the Dahabiya and the Sandal, but nothing can beat sailing in a quit rig, which was designed thousands of years ago. It can lodge up to 5 people. The deck of the boat is covered in soft mattresses and cushions and has a canopy that offers shade from the sun during the day and keeps the dew off at night. In the evening the boat will moor along the banks of the Nile where you will sleep on the open Felucca deck on mattresses, with your guide and crew under the stars. Toilet facilities are of the wild camping variety, but you’re able to use the toilets at the sites visited during the day. Food is bought in villages along the way and cooked on board by the crew, Egyptian style. Your luggage is stowed beneath the deck. If you are the adventurous type then we could arrange this fabulous Felucca Nile Trek for you. You will enjoy the relaxed pace and outdoor feel of a journey. As you cruise down the Nile the sights and sounds are simply wonderful. Donkeys braying, men slapping the water with their oars to scare the fish into their nets, kids on the bank yelling out hello, some women washing clothes in the Nile, kids swimming, farmers tending their fields growing mangoes, sugar cane and corn. During this cruise we will stop occasionally to walk through fields and villages on the banks of the Nile or to visit one of the ancient sites. The Nile North of Aswan is increasingly hemmed in by the desert, its banks lined with well-preserved Greco-Roman temples at Kom Ombo, Edfu and Esna, its lush fields with palm trees and villages. We moor up before dusk, usually at one of the mid river islands or on the river bank, before settling down for dinner. A relaxed evening around the camp fire follows, when our Nubian crew bring out their drums to sing and dance under a starry sky. It’s a true adventure and the perfect way sailing the Nile Felucca Style. This itinerary can also be made in the reverse direction: from Aswan to Luxor. We also can arrange the same voyage on board of a Dahabiya or a Sandal. The pace of a sail trek is dictated by wind and river conditions. The authentic Nile boats are built from wood and they sail without motor. The boats have to be light in order to be able to sail. On distance they will be accompanied by a tug boat which pulls it in case of wind lack or emergency. During the night the Felucca won’t sail. It will moor on the banks of an atmospheric Nile island, away off the beaten tourist track. 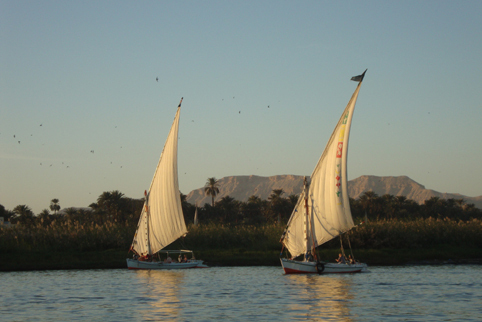 The price of the Felucca Nile Trek varies according to the number of travellers and the season. We must reserve the Felucca entirely for going on a Nile Trip. The price will thus be in proportion to the number of travellers.